For most investors, owning dividend-paying stocks is all about the income. And dividend yield is a critical metric in the stock selection process. However, there are some important concepts investors need to understand about the dividend yield formula and how to apply it to maximize their long-term financial returns. Let's take a look at what you need to know about this simple but essential formula. A stock's dividend yield is simply the annual amount it pays in dividends per share divided by the stock's latest share price. In other words, dividend yield tells you how much of a return you'll earn from income alone over any given year based on the stock's most recent price. For example, if a stock trades at $20 per share and pays $1 per share in annual dividends, then its dividend yield is 5% ($1 in dividends divided by the $20 share price). This essentially means, assuming the the dividend remains constant, every $100 you invested in the stock would earn you $5 in dividend income each year. If the stock's price also remained constant at $20 per share, you would lock in a 5% annual return from dividends over any 12-month period. Of course, stock prices are notoriously volatile and dividends can be reduced, although most companies are able to grow them over time. Regardless, knowing the dividend yield is important. For one thing, every investor has different portfolio goals. For example, if you're a retiree looking to live off dividends during retirement, then targeting an average dividend yield of 4% or higher in your portfolio can potentially allow you to replace the traditional 4% withdrawal rule. The main benefit of this approach is that rather than selling 4% of your portfolio each year (adjusting annually for inflation), you can live primarily off passive income that is not dependent on volatile share prices. Or to put it another way, your ability to comfortably pay your expenses during your golden years isn't affected as much during stock market downturns. However, while targeting a specific dividend yield for any stock or your portfolio can be a sensible place to start, there are some other important issues to consider as well. What About Dividend Yield for Stocks with Variable Payouts? Stable dividend stocks, such as most corporations and REITs, usually have regular and steadily rising payouts over time. Therefore, calculating dividend yield is as easy as annualizing their quarterly or monthly dividend per share amount and dividing that figure by the latest share price. For example, Coca-Cola's (KO) dividend payment history is below. You can see that the firm pays a regular quarterly dividend like clockwork and typically raises its dividend once per year. It's safe to assume the company plans to continue maintaining its latest quarterly dividend, which in 2018 was 39 cents per share. To calculate Coca-Cola's dividend yield, we would first annualize its quarterly dividend to figure out the dividends per share an investor would receive over a full year. Four quarterly dividend payments of 39 cents per share equals an annual payout of $1.56 per share. Dividing the $1.56 of dividends by Coca-Cola's latest stock price would calculate its current dividend yield. However, other types of income investments such as exchange traded funds (ETFs), closed end funds (CEFs), mutual funds, and exchange traded notes (ETNs) are increasingly popular. Calculating dividend yield for most of these securities is not so straightforward. Unlike stocks such as Coca-Cola that pay regular dividends at set amounts, most funds pay variable dividends. Put another way, there's no way of knowing what the exact amount of their next dividend payment will be; it fluctuates. Take a look below at the quarterly dividend amounts paid by the Vanguard Dividend Appreciation ETF (VIG), for example. You can see that each dividend payment moves up or down, sometimes significantly, from the last. Annualizing the latest dividend payment could meaningfully overstate or understate the actual amount of dividends you will receive from an investment like this any given year. The same is true with income stocks like mortgage REITs or business development companies (BDCs), which sometimes have fluctuating dividends. Many international dividend stocks also have variable payout policies in which the dividend paid each year is a fixed percentage of annual earnings. Since variable payers' dividends can change unpredictably, our best guess is that their annual dividend amount will equal their total payout over the previous 12 months. Therefore, to calculate the dividend yield on variable payers we add up the last 12 months of dividends and divide by the current price. It's important to remember that depending on the type of income investment you are considering, dividend yield may not be as useful as it is for stable dividend stocks with regular payouts. For example, while most dividend stock mutual funds and ETFs have moderate variations in annual payouts, some CEFs and foreign dividend stocks can have wildly volatile dividends. As a result, variable payers are not necessarily a great fit when targeting an overall portfolio yield; the yield you thought you were locking in can change unexpectedly. For example, the InfraCap MLP ETF (AMZA) is an ETF that focuses on master limited partnerships (MLPs). The ETF recently converted from a quarterly distribution schedule to a monthly paying one, but in the process also cut its payout 35% on an annualized basis. Similarly, many CEFs, which are known for offering ultrahigh yields often in the double digits, tend to have declining payouts over time. This means that you can't just calculate the last 12 months of dividends and assume you'll receive the same amount in the future. Which brings us to one of the most important issues to understand about dividend yield and income investing in general. In this era of historically low interest rates, many retirement-aged investors have been forced out of traditional fixed income investments such as bonds since these securities no longer provide enough yield to make ends meet. 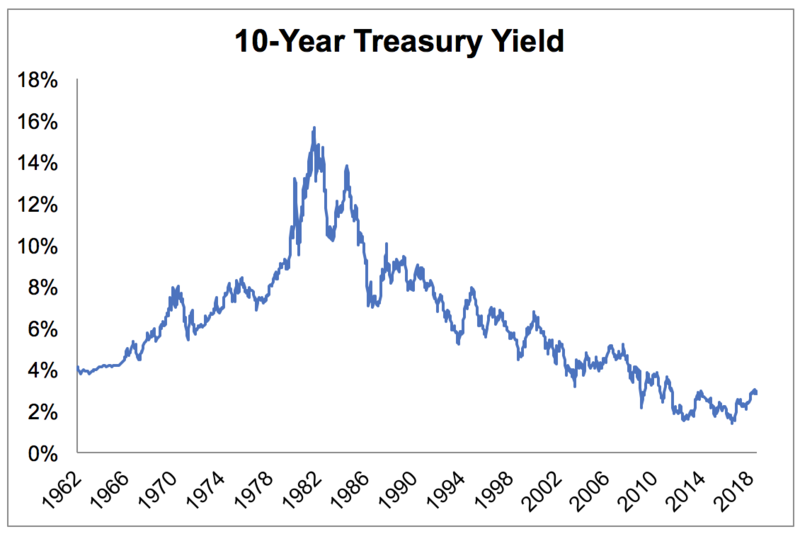 For example, the 10-year Treasury yield has steadily declined since the early 1980s and sits near 3% today. The interest payments it makes are also fixed, so inflation eats further away at its already low returns over time. As a result, many income investors find themselves "reaching for yield", meaning being drawn to stocks with dividend yields that are much higher than what can be achieved in the bond market. However, it's critically important to remember that yield alone should never be the sole criteria used for making long-term investing decisions. There is a big difference between a dependable (safe) high yield and a so-called "yield trap". A high dividend yield could indicate that a stock has an income-friendly business model (like REITs or utilities) or might be undervalued. However, it can also be a red flag because a generous yield can mean that the market is pricing in high risk of a dividend cut by drastically reducing the stock's price. For example, Buckeye Partners (BPL) is a midstream MLP that in 2018 sported a yield as high as 15%. However, the yield is so high because BPL's stock price has collapsed over the past year as the MLP has struggled to cover its distribution. As you can see below, Buckeye Partners' payout ratio entered dangerous territory, suggesting its distribution was on increasingly shaky ground. In the summer of 2018, Buckeye Partners' management told analysts that it is planning to rethink the firm's long-term capital structure and will likely shift to a self-funding business model. 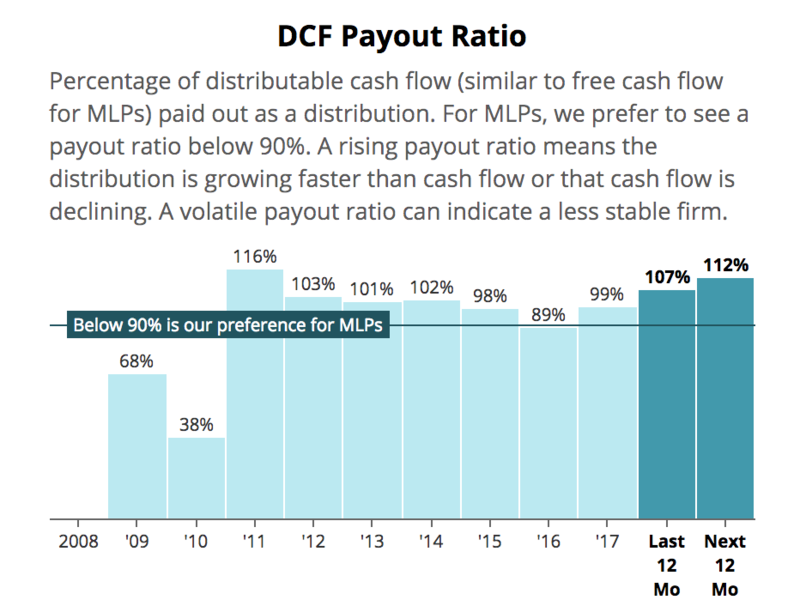 Effectively that means the MLP is planning on funding its future growth with internally generated cash flow (instead of issuing new units). As a result, the payout will likely be cut or frozen at best to provide the financial flexibility needed for this more conservative funding model. Remember that high dividend yields are not a "free lunch". If a company pays an unsustainably high dividend, meaning the payout is not covered by its cash flow, it will have to cover the shortfall either with cash from the balance sheet, borrowing, or selling new shares. None of these strategies are sustainable over the long term. And even if the dividend is covered by a company's current earnings, a dangerously high debt load can still force the dividend to be cut if the business is struggling to maintain its credit rating or meet its most important financial obligations. This highlights the importance of focusing on stable income stocks, meaning those with strong balance sheets and dividends that are well covered by cash flow. While their dividend yields may not be as high, these financially healthy firms can reinvest their excess cash flow to grow the business and thus increase the dividend over time. That generally causes the share price to appreciate and helps investors protect their purchasing power against inflation as their income stream rises. Simply put, realize that dividend yield is only one component of the total return your investment will ultimately generate. Stock prices follow earnings over the long term, so investing your portfolio in a diversified collection of businesses that appear to pay safe dividends and seem likely to grow their profits over the years is most important. The goal of every income investor should be to try to buy quality and growing income producing assets at reasonable prices. Doing so ensures not only safe and rising income over time, but also healthy total returns that increase the size of your portfolio. Dividend yield is an important starting point for building an income-focused retirement portfolio that can help you achieve your long-term financial goals. But while dividend yield is a simple and powerful formula that can be useful, it's important to remember that yield, like any single investing metric, can't be used in isolation when making investing decisions. Stocks with the highest dividend yields can possess the greatest risk of dividend cuts and permanent capital losses. Their generally lackluster dividend growth can also be an issue since their payouts often don't keep up with inflation, gradually eroding an investor's purchasing power in retirement. As conservative income investors we focus on safe dividend stocks, meaning those with business models that generate relatively steady earnings and cash flow growth over time. This, combined with strong balance sheets (safe debt levels) and reasonable payout ratios, allows their dividends to grow in all types of different environments. In today's low-rate world, it's difficult to build a well-diversified stock portfolio that's invested in quality companies and offers a dividend yield above 4%. However, with an understanding of how dividend yield is calculated and the various signals it can send, you should hopefully be in a better position to thoughtfully construct a dividend portfolio that aligns with your financial goals and matches your risk tolerance.